As is often the case, it’s not a single driver that shapes a trend but rather a confluence of many. 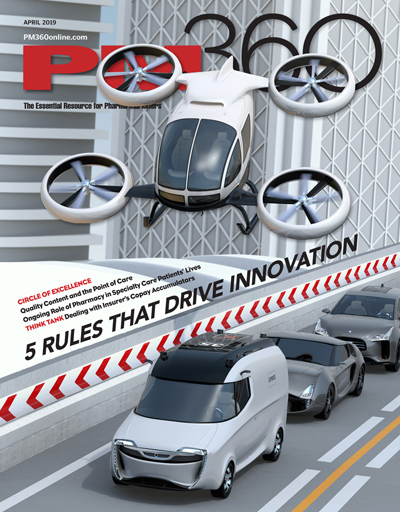 This month we look at some of the ways brand managers can use leverage points along the patient journey to bolster health outcomes and uncover opportunities for their brands. Brand teams continuously strive for a deeper understanding of how patients move through the healthcare system and how they are influenced by a variety of stakeholders along the way. Many refer to this series of events as the patient journey, the treatment path a patient takes from diagnosis through to a health outcome. Its meaning, however, is defined differently depending on the stakeholder. For the brand team, the primary goal of mapping the patient journey for any given condition/disease is to identify leverage points that, if activated, drive patients to a desired outcome. We often use the analogy of a river to represent the “flow” of patients. Leverage points are like dams in the river that, if placed in the right spot, will direct the flow of patients to a particular brand. This traditional treatment flow diagram has been the standard for understanding how and when patients consume pharmaceutical products. It does not, however, tell the complete story of how patients enter the healthcare system and start to use healthcare resources, such as diagnostic tests, for example. Often, and unnecessarily so, brand teams will deploy one-off projects to address questions left unanswered by traditional treatment flow analysis. When “patient journey” is used in a marketing context, it usually represents a qualitative map of the flow and various touch points. Figure 1 represents the key phases a patient encounters on a typical patient journey. On the left side of the flow is initial awareness and recognition, then comes diagnosis and then onto the treatment phases. Leverage points occur in each of these phases and when they are properly understood, we can start to see opportunities to improve outcomes. Although most of us agree that there are many factors at play that define the patient path, many marketers often attempt to construct a patient journey without taking a holistic, data-driven approach. In these situations, they may be missing valuable insight. What Makes For A Holistic Approach? Identifying what you already know—or think you know—can guide a plan for filling in the gaps. Harnessing the institutional knowledge that is often dispersed through an organization can be a daunting challenge, but one that is worth the investment in that it provides a sound starting place and ensures a systematic identification of gaps. Secondary data analytics—identifying what a patient experiences from a diagnosis and treatment perspective—can be used to fill in gaps and can help to quantify the potential value for activating each identified leverage point. A blend of qualitative and quantitative primary research—along with longitudinal analytics and following a longitudinal assessment—provide deeper insight into many of the “whys” around patient behavior, and can help with more comprehensive understanding of “what happened.” The increasing availability of clinical data on larger scales also provides a deeper understanding of the relative opportunity of critical decision points—symptoms that brought a patient to the office, decisions to treat or not, and whether to change treatment are more readily available today and provide an enhanced understanding of the leverage points a brand may target. 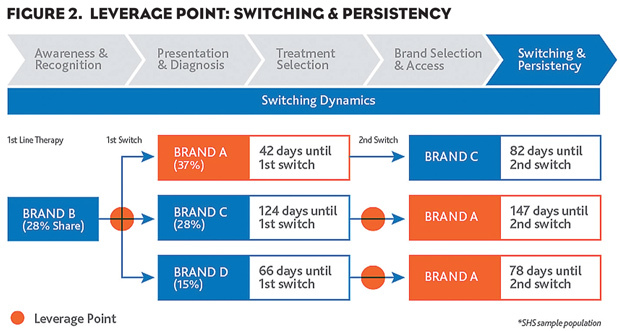 In Figure 2, for example, we look at patient switching dynamics for a blinded brand, a key leverage point for many patients in their treatment flow and one of critical concern to brand managers. It is easy to see how quickly patients are being lost to other brands during this phase. Armed with this knowledge, a brand manager can apply tactics to prevent some of this “leakage.” Primary research can be deployed to further explore drivers of this leakage. Once a patient journey map has been constructed and opportunities uncovered, these opportunities then need to be prioritized. Figure 3 shows an example of key opportunities in each phase after prioritization based on how likely they are to be achieved and, if they were achieved, how much benefit they will offer in optimizing care. Ultimately, the most important part of the process is the ability to bring together multiple inputs in order to create a road map for leveraging brand opportunities—which is not only actionable, but provides insight into the ROI of each action. How quickly do patients move to second-line or later? Can you shrink that time lag? What is the top first-line choice? Who is making the decision, i.e., which specialty? Where are the decisions being made, i.e., treatment setting? Who are the decisions being made for, i.e., patient type? How are these decisions being paid for, i.e., payment type? Are there issues with diagnosis? Is there a need to drive awareness? Testing? Does treatment lag behind diagnosis? Can DTC activities influence this or is it more payer and physician influenced? Derek Evans is Senior Vice President/Commercial Effectiveness Practice Head with Symphony Health Solutions. RIP Business Strategy Orthodoxy—and Good Riddance!